In prayer, the Father speaks His Word to us. This is the Word whispered deep into our humble poverty so that in our frailty we might know a love that surpasses every hope. This eternal Utterance tenderly resounds in humanity’s deepest needs and sorrows to disclose that ancient hidden joy which bubbles through all that is. Prayer rejoices in this truth. At the same time, through tears of compunction, this Sword of Truth relentlessly attacks and shatters the crystalline myths whose momentary enchantments ensnare us. In silence and faith, this same boundless Fount of Mercy erupts deep in the heart to give birth to the most wonderful freedom. Through persevering vigilance, this very Light dispels all manner of falsehood while offering a vision that knows reasons beyond the power of sin and death that unaided human reason cannot know. Those who pray with humble desire for God rejoice in this Truth, and their jubilation explodes into works of such tender sacrifice for others that there is no plausible explanation for them within the narrow confines of this mortal existence. No heartless calculation and no servile fear suffice to explain their gentle kindness or quiet patience. If ever frustrated they are enveloped in peace – even if it is not felt. If ever exasperated they are established in stillness – even when everything is falling apart around them. By what they receive in prayer, they shine with warmth in the cold darkness as a sign of contradiction: their courage speaks to a new life too sublime for this life to contain, too wonderful for this world to know, too powerful for even death or another evil to overcome. The most sincere authenticity compels them to bear all kinds of hardship and difficulty to comfort the misery of their neighbor. Prayer causes them to see not only strangers and even enemies as their neighbor, but also their spouses and children and parents and co-workers — everyone in their lives is someone God has entrusted to them and their hearts are weighed with sorrow that anyone should be anonymous to them. In fact, no matter how much they love their neighbor, they feel more indebted to their neighbor than their neighbor feels indebted to them because they see in their neighbor an icon of God, an image of the Truth that ravishes their souls. If they are humiliated, rejected and suffer all manner of sorrow for their kindness, such souls would not have it any other way – for these people of prayer cannot stop themselves from rejoicing with awe-filled wonder before the dynamic mystery to which they must respond. The only way they can respond is love, for no matter how much they love, their hearts are only the more wounded by this indescribable realization of just how much more He has loved them. Note from Dan: Anthony’s fantastic book on prayer, Hidden Mountain Secret Garden, can be found HERE in print, and HERE in Kindle format. 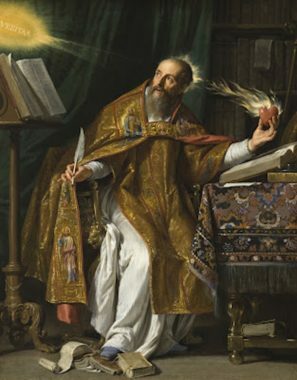 Art for this post To Rejoice in the Truth: Saint Augustine, Philippe de Champaigne, between circa 1645 and circa 1650, PD-US author’s life plus 100 years or less, Wikimedia Commons.